Sirawit's Accomplishment - Congratulations to Sirawit Shimpalee! He won an international audition to perform in the 2019 High School Honors Performance Series at Sydney Opera House. Sirawit is our principal oboist in the Spring Valley Symphonic Band and in the South Carolina Youth Philharmonic. Jane McCallum- 1st Alternater Horn, and Jane is also 1st Chair Horn Clinic Region. Chris Juhn for being honored at All-State as concertmaster and principal (1st chair) clarinet. Chris also won 2nd place in the Phi Beta Mu scholarship audition and will receive $500.00 toward his tuition. Chris Juhn was also awarded the "Most Outstanding Bandsman" for the state by Phi Beta Mu International Bandmasters Fraternity. John Phillips Sousa Award/Outstanding Senior Musician - Christopher Juhn, Dennis Patterson, Jr.
​Christopher Juhn earned a featured performance in the SCBDA State Master Recital. Chris performed at this showcase event February 4, 2016 at the Hootie Johnson Recital Hall in the Darla Moore School of Business facility at USC. Solo and Ensemble 2016... Casey Carter, Kevin Kim, Mazen Cotran, Christopher Juhn, Victoria Hopkins, Dennis Patterson Jr. , Alan Port, Macey Coulter, Raechal Sampson, Alex Whitson, Gloria Kim, Nate Hammonds, Austin Myers, Brandon Searcy, Zach Whitson, Chanze Pearson, Ethan Goodman, Dasia Owens, Anderson Bowers, Tyrell Fishman, Breanna Murrin, Glennith Johnson, Matthew Moore, Ryan Brock, Jacob Brock, Eloise Lamie, Melody Davis, Carson Fields, Dexter Almond, Melody Davis, Eric Whitlow, Ethan Dilley, Dylan McCormick, Jordan Seeger, and Trado Mayson. Mimi Harding - Flute - competed in the live performance round of the SCBDA State Master Recital. The top soloists from every band in the state submitted an audition recording of their performance of a major solo concerto or sonata. 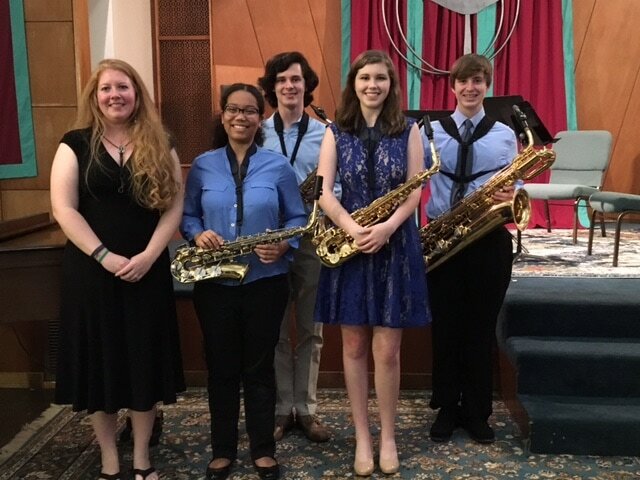 Out of the taped auditions, 16 students were selected to perform in The Master Recital that was held February 6th in Charleston as part of the State Music educators Conference (SCMEA). Mimi's performance earned her first place from each of the judges. She received a scholarship, as well as the opportunity to be recognized and perform her solo at the All-State Clinic for the Hall of Fame Banquet. Mimi Harding won the South Carolina Philharmonic Youth Orchestra Concerto Competition. Mimi performed a concerto with the orchestra and received a scholarship. Mimi also won in the INSTRUMENTAL category, SENIOR Division of the Columbia Music Clubs Scholarship Auditions at Columbia College. Mimi gained a scholarship from this fine performance. Troy Herrmann - French Horn - was one of only one hundred high school students from across the country who performed with the Honor Band of America during the National Concert Band Festival at a sold out Clowes Hall in Indianapolis, IN. This is a very elite ensemble, which is selected through a very difficult and highly scrutinized audition process. Troy earned 1st chair out of the 10 Horns who were selected in the country. The Spring Valley Symphonic Band was selected to be the featured performance at the General Session at the State SCMEA Conference, which was held in Charleston on February 8th, 2014.
in January at the BCS National Championship Bowl in Miami.